All God's Children's Before and After School program is for families who need care for their children grades kindergarten through grade 4. We are open at 6:30 a.m. and close at 6 p.m. Even though we are open for 11.5 hours, a child can be here no more than 10 hours. Parents must bring their child to the school age room, regardless of age. Our staff keep a similar work schedule all year long, they know the children need consistency where they are cared for. We do have a list of subs for our staff, and they are considered apart of the AGC team as well. Nutritious snacks are provided at AGC, once before school and again after school. The snacks meet the nutritional guidelines set by the state and contain foods from at least two of the food groups and/or skim, 1% milk or %100 juice. A weekly schedule is posted for parents to see. A prayer will be said before each meal thanking God for His provisions. On a child's birthday, they may choose to provide snack for their friends at childcare and it does not need to follow DHS guidelines but does need to be prepackaged. The transportation between the school and the Shueyville United Methodist church is provided by College Community School District (CCSD) in Cedar Rapids. Staff will call parents if their child did not make it off the bus unless parents previously notified AGC. On Wednesdays after snack, the kids meet with Josh Swaim, from the church office, for chapel time. They meet in the sanctuary of the church during this time. Every other day one of the AGC staff members do bible time with the children. They read a story from the bible, ask questions and let the children share their thoughts and questions. The staff and children play group games inside, outside and enjoy the playground, pavilion, and basketball court. Many large motor games will be played in the Family Life Center, in the church, when it is too hot, too cold or raining. The children may be grouped in variety of ways for activities by grade, ages, interests, and skills. Some of the free choice activities include crafts, music, reading, building blocks, plays, and group projects. There is a Childcare cell phone number that is available to parents in case the children are out of the room like playing outside or on a field trip. This number can be used to let the staff know that your child will be absent, late or any information relating to your child. We want you to know that you are able to reach your child at all times! There is an option for care on days with no school. You don't have to be enrolled in our Before and After school program to utilize care on these days. Enrollment is still required though. We don't offer drop in care. We are open from 6:30 a.m. to 6:00 p.m. Although we are open for 11.5 hours, a child may be under care for no more than 10 hours per day. If already enrolled at AGC, there is an additional charge for No School Days and Snow Days. The charge is based on what your child is currently enrolled in now. These transactions will occur with in the next 10 business days following the event or following the last day of Winter or Spring Break. Parents must bring their child to the room, regardless of age. Staff want to make personal contact with each parent so that it is known that the child has arrived. There is an option to eat AGC's provided lunch with an extra charge, or else a sack lunch needs to be brought. If a snow day is decided after the child has been dropped off, AGC will provide lunch and $3.50 will be deducted from the family's account by the end of the next business day. AGC will provide milk for lunch and juice for the snacks. There are two nutritional snacks, one in the morning and one in the afternoon. We recognize that children also need "down time" and will provide opportunities for the children to relax in a comfortable environment. At times, we offer a G-rated (PG with parental approval) movie after lunch for the children to enjoy. The specific movie, group activity, etc. will be posted for parents. On snow days, a schedule will be made and posted by the end of the day. It is up to the discretion of the director if the center closes due to severe weather. Parents will be notified if decided to do so. There are limited spots available in our before and after school program, we encourage you to act fast to reserve your child’s spot. To apply for enrollment, go to our Enrollment tab and fill out the form. The AGC office will be with you in next couple of days. All Tuition is collected via Electronic Funds Transfer (EFT) every 4th week. The enrollment fee can be paid either by EFT or check. This fee includes a fee for supplies for the school year. There is a separate enrollment fee for the summer. There is a $20.00 Non-Sufficient Funds return fee. IF for any reason you are in need of special payment arrangements, please discuss your needs with the Director. 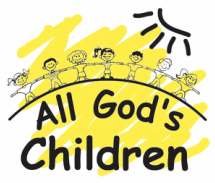 For more in depth information on All God's Children's Before and After School program, see our Handbook.